The herb butter may be prepared ahead and even frozen until ready to use. To Prepare the Herb Butter: Soften the butter at room temperature for 1 hour. Whip the butter and all the other ingredients together with an electric mixer, food processor, or with a wire whisk. Cover and refrigerate until time to use. To Prepare the Shrimp: Preheat the oven to broil. Butter a flameproof baking dish, just large enough to accomodate the shrimp in a single layer, with the 1 tablespoon butter. Arrange the shrimp, lightly salt and pepper. Add the white wine, place over direct heat and bring to a boil. 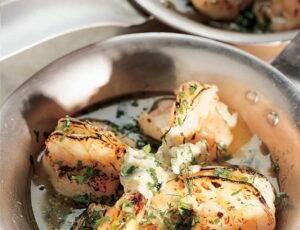 After the wine boils, turn the shrimp over, allow to cook for less than 1 minute, and remove from heat. Be careful not to overcook. 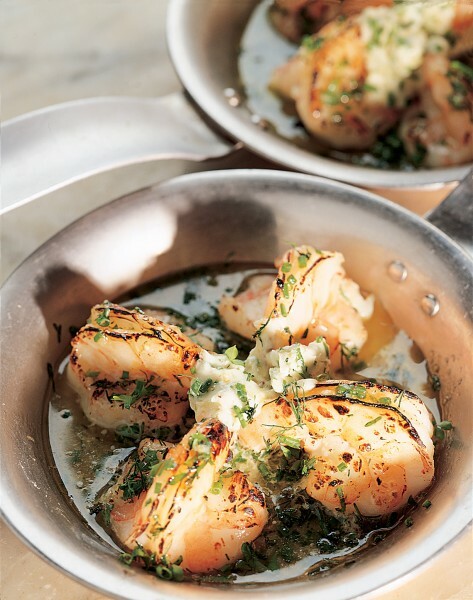 Dot the shrimp with 2 tablespoons of the garlic and herb butter and place under the broiler until the butter melts. Serve at once. Variation: Substitute lobster tails or prawns.